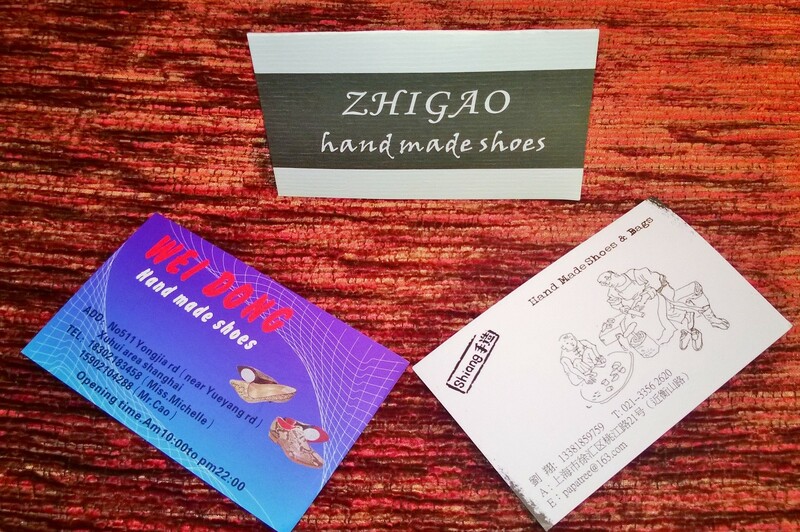 The hunt is on…where will we buy our first pair of handmade shoes??? As we explore the streets of Shanghai, especially in the former French Concession, Thom and I have been lusting after leather that feels like butter, hand carved soles and unique designs. Oh my, come to momma!!! “we are proud of being persistent to make our products by hands” is the proud motto of one shop we found. All small and tucked away on quiet, leafy streets, the cobblers work on their product while you browse their samples of all colors and styles. Thom, who has long been a “shoe whore”, had it so bad for a pair of ridiculously gorgeous boots that I promised that we could each get a pair of handmade shoes while here in Shanghai. Yes, I’m weak but what the Hell, you only live once, right??? And he looked so pathetic cradling the shoe like a little baby..and the leather was as soft as a baby’s bottom to boot. Oh, and speaking of boots, that’s what I’m going for-you can take the girl out of boot-crazy Seattle, but the you can’t take the passion for boots away from this girl. Many expats have extolled the virtues of getting hand-tailored clothes here in Shanghai and Thom has certainly been eyeing fancy, bold print long “Neo” jackets (he’s a Matrix fan as well as Dr. Who) but I have a feeling that nothing will be as wonderful as boots perfectly encasing my feet. I’ll keep you updated as the vetting process continues and then the fun begins–the creation of our perfectly unique shoes.